The Acrolinx Desktop Checker is available in your notification area (system tray) after installation. You can also configure the Acrolinx Desktop Checker to start automatically when Windows starts. 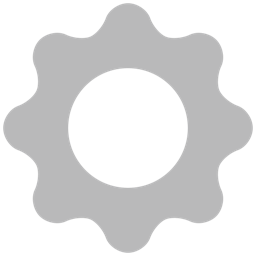 If the Acrolinx icon is not visible in your notification area (system tray), you can start the Acrolinx Desktop Checker with the Windows Start menu. In the Windows taskbar, select Start > Acrolinx > Acrolinx Desktop Checker or click the Acrolinx Desktop Checker shortcut on your desktop. A Desktop Checker shortcut is installed on your desktop by default unless the custom setup settings were changed during the installation. (Optional) To ensure that the Desktop Checker always starts when you restart Windows, right-click the Acrolinx icon in the notification area (system tray) and select Start Automatically When Starting Windows from the Acrolinx menu. You can select the items in the Acrolinx menu to activate the Acrolinx commands . When you first use Acrolinx, or if you change your Acrolinx installation, you must register with the Acrolinx server. Depending on the configuration of your Acrolinx server, you might also have to enter a password or add custom user information. Run a check or open the Acrolinx options. When you are prompted, type your user ID. Note: Usually, your Acrolinx administrator wants your user ID to be in a specific format. That way, your administrator can tell who's who when reviewing the list of user accounts. For example, a lot of people ask their writers to register with their e-mail address. If your administrator hasn't told you how to register, try registering with your e-mail address or ask them what they'd prefer. If you are prompted, type your password. Acrolinx registers with the Acrolinx server. Before you start checking, make sure that you have the right checking options. Even if your company has someone who sets up Acrolinx for you, it's still good to know what these options are for and how they work. 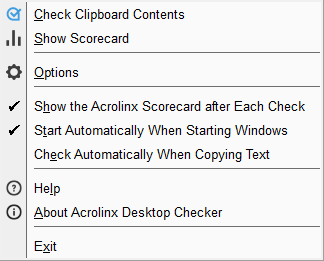 A checking profile contains all the Acrolinx presets that you might need to check a certain type of document. For example, you could have a checking profile for Word documents and another one for DITA topics. Whoever administers the Acrolinx server in your company can set these up for you. Just select an item in the "Checking profile" dropdown, and the rest of the settings are configured for you. You might notice that the checking options are disabled when you select a checking profile. This means that whoever set the profile up has "locked" it. They don't want you change the options and override it. But at least you don't have to think about what to options select. You set the checking options yourself . If your administrator hasn't enabled the checking profiles feature, you won't see a "Checking profiles" dropdown. In this case, you can set the options yourself. You should see the following options on the Check tab. Language Select the language of the document you want to check. Writing guide Select the writing guide that you want to use for the check. Writing guides contain specific guidelines for your company writing style. Your administrator can group these guidelines into sets that apply to different types of content. For example, the guidelines on sentence length might depend on your audience. You can then select a writing guide that applies to your audience. Spelling Check for spelling issues. Grammar Check for grammar issues. Style Check for style issues. Reuse Check for reuse issues. Reuse issues are usually sentences that look like sentences which are already in a content repository such as a translation memory. The idea is that you update the sentence you just wrote to be identical to the sentence that's already been translated. That way, the sentence doesn't need to be translated again. Reuse is a licensed feature so if your company hasn't purchased it, the option will be disabled. This option is only relevant if you're writing content for the web and you want it to get high up in the search results. Some administrators want to make sure that writers use specific keywords so that the content gets high-quality traffic. SEO is a licensed feature so if your company hasn't purchased it, the option will be disabled. Deprecated terms Check for terms which are deprecated in your terminology database. Valid terms Check for terms which are either preferred or admitted in your terminology database. You might do this if you want to see how often you use the correct terminology. Admitted terms Check for terms which are admitted in your terminology database. Admitted terms can be terms that are OK in certain contexts but have specific guidance on when they're appropriate. Some administrators want to draw your attention to them and make sure that you're aware of the conditions for using that term. However, not everyone uses admitted terms, so this feature isn't enabled by default. Your Acrolinx administrator has to enable it first. New terms Identify words of phrases that look like they could be potential terms which you could add to your terminology database. Some administrators like their writers to contribute terms to the terminology database so this option can help you do that. Again, not everyone wants writers to contribute terms, so this option is often disabled. Your Acrolinx administrator has to enable it before you can use it. Term sets Select the term sets that you want to use when you check for terminology issues. 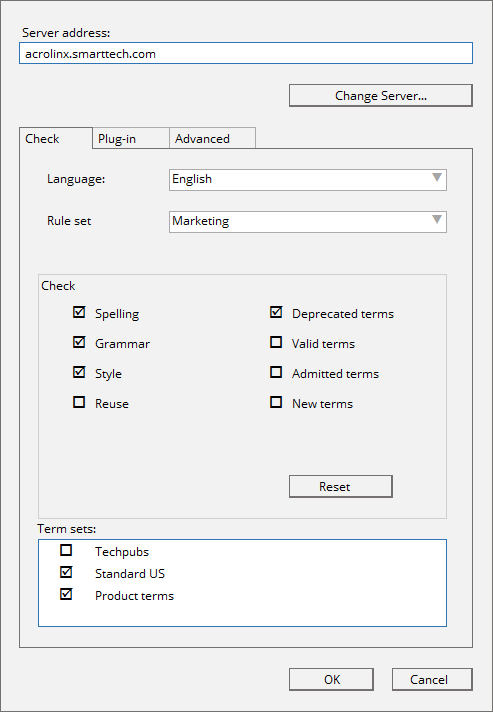 Term sets provide a way to group different sets of terms for different audiences. Your Acrolinx administrator sets these up, so if you're unsure what to select, ask your administrator. There are also other options like the plug-in, filter, and advanced options but you can take a closer look at those once you've run a few checks. After you've updated the checking options, you're ready to run your first check. Writing guides are specific guidelines for your company writing style. Your administrator can group these guidelines into sets that apply to different types of content. For example, the guidelines on sentence length might depend on your audience. You can then select a writing guide that applies to your audience. Before you get going, if you might want to consider which part of your content you want to check. Acrolinx doesn't some pretty heavy-duty linguistic processing so if you're working on a 300-page magnum opus, you probably don't want to check the whole document in one go. It could take a while and you won't be able to continue writing until Acrolinx is done checking. However, If you're working on a 250-word article, it's fine to check the whole thing each time. To check the entire document, click the Check button. To check only part of the document, first select the text that you want to check and then click the check button . Once Acrolinx is done checking, you'll get a Scorecard that scores your content based on the types of issues that you're checking for. You'll also get an overall Acrolinx Score. Click OK to close the Scorecard dialog box and start reviewing your content. Unless your content is already flawless, you'll see that Acrolinx has highlighted some issues with colored highlighting. You can click and interact with these highlighted sections of text with the Acrolinx shortcut menu. We cover how to work with issues more in-depth in the article " Checking, Reviewing, and Correcting Your Content ". Before you get going, if you might want to consider which part of your content you want to check. Acrolinx doesn't some pretty heavy-duty linguistic processing so if you're working on a 300-page magnum opus, you probaby don't want to check the whole document in one go. It could take a while and you won't be able to continue writing until Acrolinx is done checking. However, If you're working on a 250-word article, it's fine to check the whole thing each time. To check only part of the document, first select the text that you want to check and then click the Check button. Once Acrolinx is done checking, you'll get a Scorecard that scores your content based on the types of issues that you're checking for. You'll also get an overall Acrolinx Score. Click OK to close the Scorecard dialog box and start reviewing you content. To check the document, click the Check button. Unlike other Acrolinx plug-ins, you can't select and check smaller sections of text. In Oxygen, Acrolinx always checks the whole document. To check a specific field, place your cursor in the field that you want to check and click Check Field . Unless your content is already flawless, you'll see a corrections dialog box that shows sentences with colored highlighting. These highlighted sections of text indicate potential content issues. We cover how to work with issues more in-depth in the article " Checking, Reviewing, and Correcting Your Content ". After you have set up the Acrolinx options, it's easy to run a check. Once Acrolinx is done checking, you'll get a Scorecard that scores your content based on the types of issues that you're checking for. You'll also get an overall Acrolinx Score. Left-click the Acrolinx icon in your notification area (system tray) or select Check Clipboard Contents from the Acrolinx menu. (Optional) If you frequently copy text that must be checked, you can save clicks by selecting Check Automatically When Copying Text from the Acrolinx menu. When this option is selected, a check starts automatically whenever you copy text to the clipboard. If you have configured the Desktop Checker to show the Scorecard after each check, click OK to close the Scorecard dialog box and start reviewing your content.